If you receive an Art Scholarship Award, the final expectations to receive the award are as follows…. 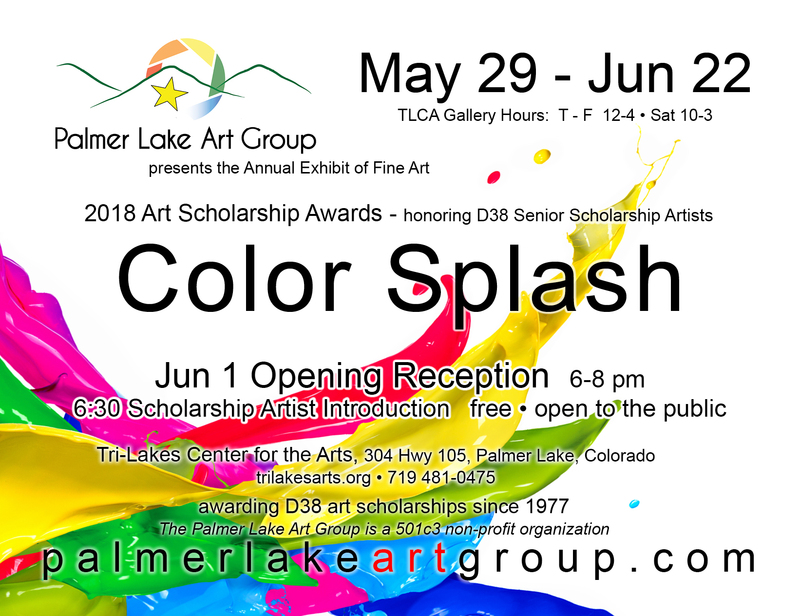 • up to 3 art pieces will be displayed in the Palmer Lake Art Group’s annual June Color Splash Art Show, along with art from professional artists along the Colorado Front Range usually hosted by Tri-Lakes Center for the Arts in Palmer Lake. • in May at Senior Awards Night, you will be recognized and presented a scholarship award certificate. • you will be a Featured Artist at the Opening Reception for the June Color Splash Art Show. • final requirement is that a visual arts class be included on the schedule submitted to PLAG. • a check for your one time award will be sent to your account at the financial office of your institution. Required: Copy of your class schedule which includes a visual art class, student ID number, and mailing address of your financial office before Jun 1.